Information is the driving force of the entertainment business. Keeping it up to date within your company is essential. inEntertainment’s Projects Module makes sharing information second nature. Track any kind of project from conception to completion – Feature Films, Television, Theater, Commercials, Music Videos, Voice-overs, or Print Jobs. Create submission letters and appointment slips within the Projects Module and link them to clients, casting directors or producers. Easily create follow up calls for client submissions and appointments. Create tracking and grid reports, printed in an easily readable format, with an automatically generated table of contents. Import new or updated project data from a variety of Internet sources. Create calendars for project tasks. 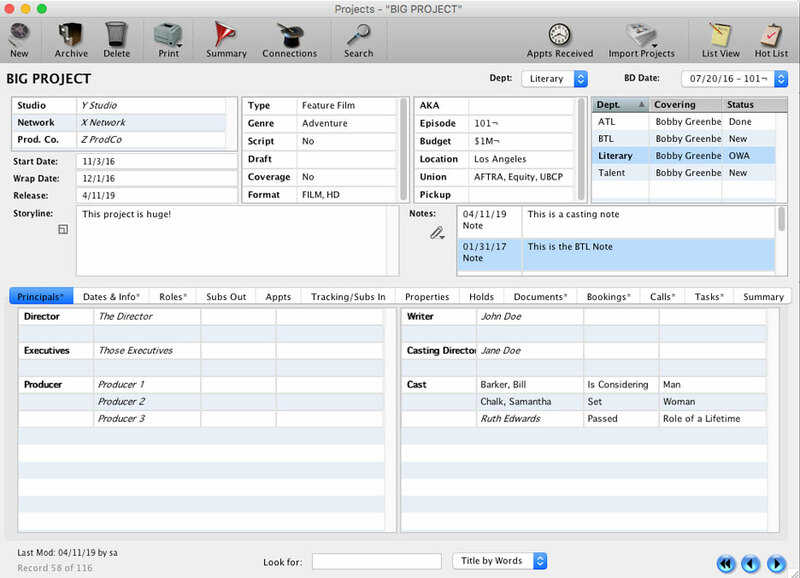 Link documents to a record for easy access to items such as scripts, sides and reels. The Projects Module has functions that address the needs of all entertainment professionals, from agents and managers to casting directors and producers.